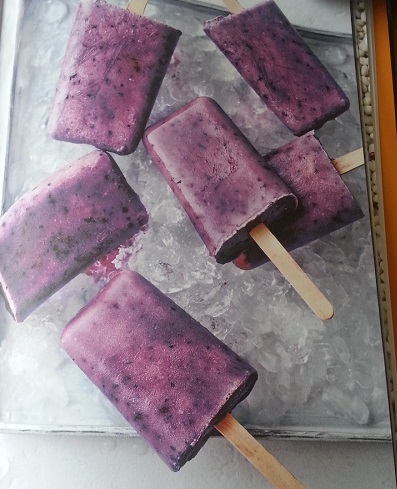 Is a great recipe 300 g of fresh or frozen blueberries method put all ingredients in a blender and blend300 g of fresh or frozen blueberriesDiabetic ice creams are not the normal vocabulary for diabetics! The best diabetic ice cream ever is a big claim, but one which is entirely justifiable. Home-made ice cream is so much nicer than shop bought ice cream. When you buy ice cream you have no idea how many chemicals, e numbers, additives and any other nasties are, plus added sugar. The beauty about this diabetic ice cream is the fact you don’t need any special equipment to make it, it is just five simple everyday ingredients. The end result is a delicious tasting and nutrient dense ice cream perfect for a hot summers day. If you can’t buy ice cream moulds then get some plastic cups and freeze them, once they are frozen you can simply run under a cold tap for a minute to release the ice cream on a plate and eat with a spoon.It is a great recipe to make with children because it is so simple and quite honestly it takes longer to eat it and it does to make it. The star ingredient has got to be the coconut milk. Many of you will have heard that can contain saturated fat and in fact this is true. But saying all saturated fats are bad for you is a bit like saying all cars are black! The fats contained in coconut are medium chain triglycerides these are broken down very quickly by the enzymes secreted by the lining of the blood vessels and this makes it a very efficient energy source because it’s an efficient energy source is easy to use. This means that it’s unlikely to be stored by the body or cause any problems in the cardiovascular system. Coconut is neither a fruit nor a not, it is a one seeded drupe. Creamed coconut or coconut milk is manufactured in a similar way to other dairy products. The coconut flesh which is white is first created and then soaked in hot water. The coconut cream rises to the top and can be skimmed off the remaining liquid is squeezed through cheesecloth to extract a white liquid that is coconut milk. In most countries coconut milk can be bought in tins or cans. Coconuts are highly nutritious and rich in fiber, vitamins C, E, B1, B3, B5 and B6 and minerals including iron, selenium, sodium, calcium, magnesium and phosphorous. Unlike cow’s milk, coconut milk is lactose free so can be used as a milk substitute by those with lactose intolerance. It is a popular choice with vegans and makes a great base for smoothies, milkshakes or as a dairy alternative in baking. MCFAs are rapidly metabolized into energy in the liver. It is thought that unlike other saturated fats, MCFAs are used up more quickly by the body and are less likely to be stored as fat. This does not exempt them from contributing to heart disease – they are still a fat – but they have a different effect than saturated fats. Because of coconut milk’s high content of saturated fatty acids, it is still seen as a food that should be consumed in moderation. Use unsweetened coconut flakes And add very hot but not boiling water. Leave to stand for 10 minutes then run through a sieve. It can be stored in the fridge for three or four days. Put all the ingredients in a blender and blend until fairly smooth. Pour into ice cream moulds or plastic cups and freeze.